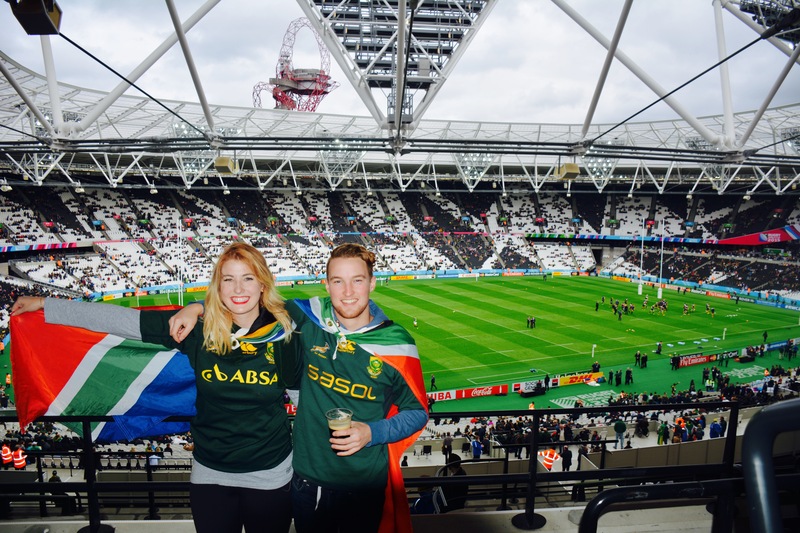 Taken by Margie de Jager at SA v. USA game in London. Thank you for giving us something to believe in. Something that is bigger than ourselves. Thank you for giving us something intangible that can’t be described, only felt. What a World Cup you’ve had so far. Look how far you’ve come. Look how much you’ve learned. And look how well you have carried yourself through it all. 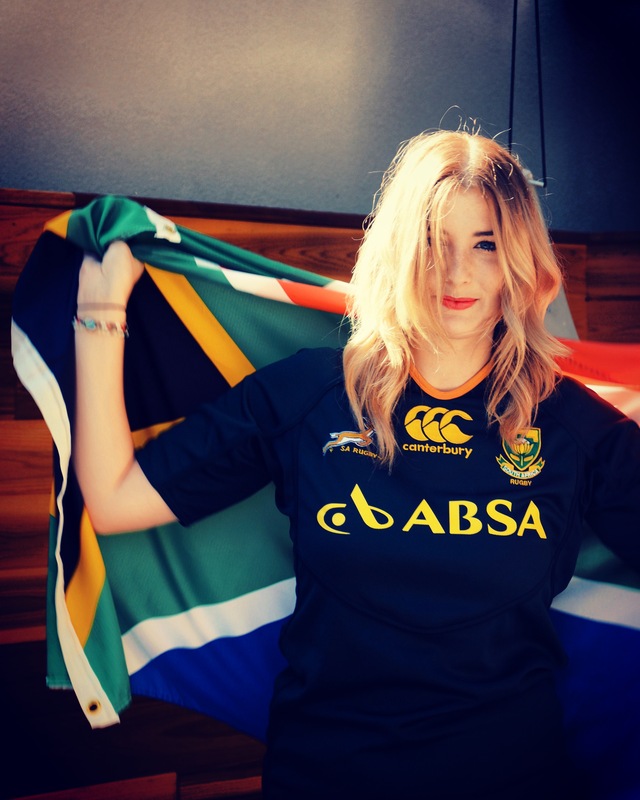 I don’t think I’ve ever been as proud to be a Springbok Supporter as I am today. So I want to say thank you. Thank you for teaching us that being humbled isn’t always easy, but it is necessary. Going into the game against Japan, we all thought it would be a warm-up game. You showed such grace which gave your fans permission to carry on in good grace and sportsmanship. Thank you for wearing your hearts on your sleeves. From the moment you step onto the field, the fans can feel your passion and love for the game. Every single one of you sang the anthem from the bottom of your hearts. Thank you for showing us what patriotism looks like. Your celebrations of the great plays and close wins taught me to be fully involved with whatever I am doing and celebrate the victories, no matter how big or small. The moments of sadness must also be remembered, as they are often just as important as the celebrations. For 80 minutes a game, you gave your all. And today, unfortunately it didn’t go our way. You showed us that you are allowed to be disappointed in yourselves, because you hold yourself to such a high standard. But you also showed us how to be disappointed without being bitter, which is not a trait that comes easily to most. You showed us how important it is to leave it all on the field. Thank you for letting us in. The personal posts on Facebook and Instagram help people to realize that you are only human. You put your shorts on one leg at a time and go to work just like the rest of us. Thank you for sharing pictures of your families and friends, and for allowing us to be a part of your journey. Thank you for remembering the past. By paying tribute to the 1995 Championship Team with the run in Trafalgar Square, you’ve proven once again that South Africa’s history is one worth remembering. South Africa is a country with a history that is not always easy to talk about and you’ve continued to show and celebrate how far we have come. You’ve established hope and showed us our potential as one nation. Thank you for showing us how vast and strong our South African culture lives throughout the world. It was amazing to see the comments on my last post and have so many South Africans reach out to me with similar thoughts and connections with the game and with the team. 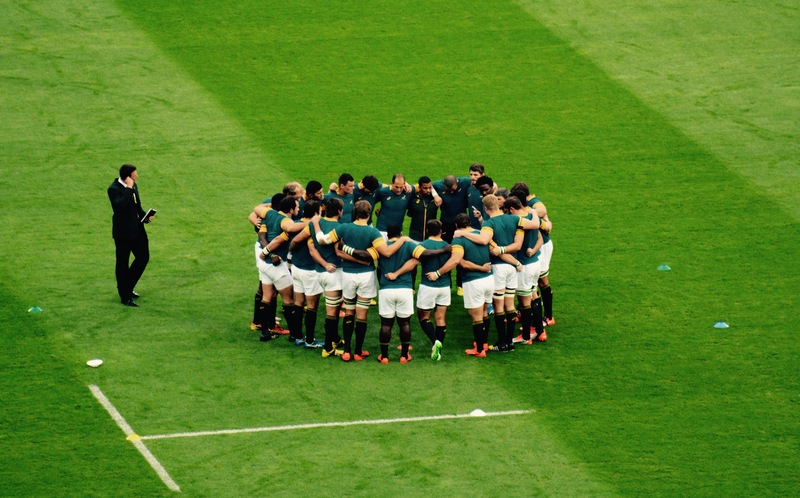 It gave me an even deeper appreciation for what it really means to be a Springbok Supporter. Green blood runs thick. 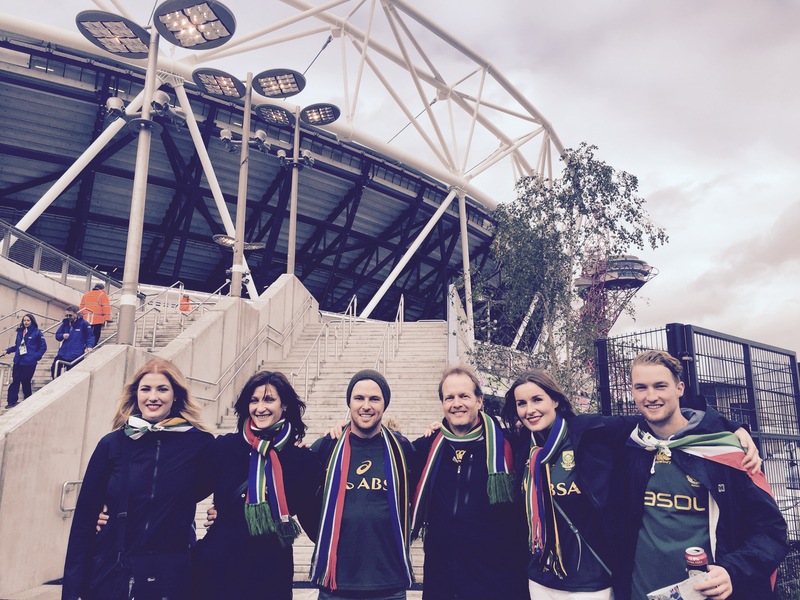 When in London, I could go up to anyone wearing a Springbok Jersey and become instant friends. 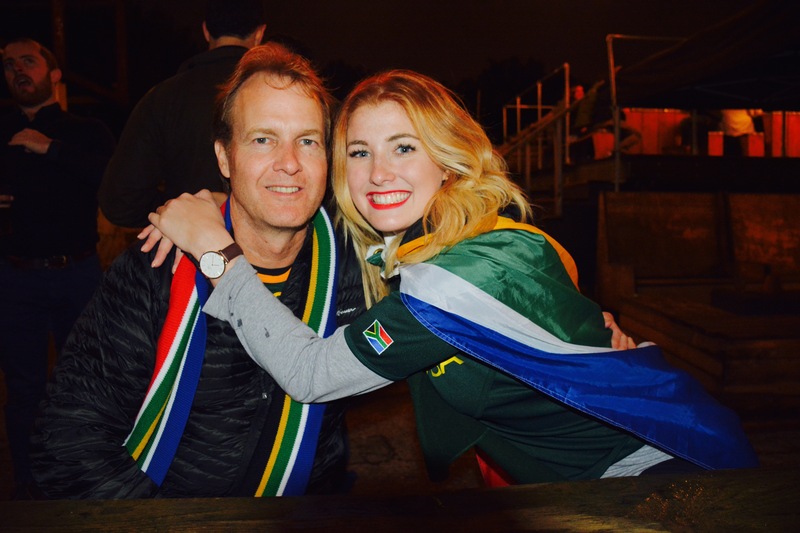 At closing time a bar in Shoreditch after the SA vs USA game, a group of Springboks supporters including myself and my family sang Shosholoza as if we were lifelong friends with everyone included. I’ve seen countless videos of fans singing the anthem together. Thank you for uniting a nation, one that has spread all around the world. Thank you for taking the responsibility of holding 51 Million supporters on your shoulders. That is not an easy job. By becoming a Bok, you accepted that role with full knowledge of how many hearts you now hold in your hands. Thank you for taking that responsibility so seriously and making everyone so very proud. Thank you for being gentlemen. In a world that is often plagued by negativity in the media, it makes me so proud to know that we have a team of men who do not take being a gentleman lightly. On and off the field, we only see and hear good stories about you. You don’t complain about the ref, you give credit where credit is deserved, you back each other up, you fight like hell not to let each other down, and you hold yourself to higher regard. The little things like helping up other players, forming honour guards, and offering and accepting condolences from opponents, helps us all gain perspective about fundamental kindness. You’ve shown us that Rugby is about more than the 80 minutes of play, it’s also about being a decent human being. Thank you for being incredible ambassadors to the game and amazing representatives of your country. That alone is a gift greater than anything. Boys, I am so proud of you. We know how badly you wanted to bring the cup home to South Africa and I know you are disappointed. But I just want you to know that what you’ve given the fans during this World Cup is absolutely priceless. Giving a country something to believe in and giving a nation that is spread across the world a reason to come together is a feeling that none of us will forget. Consider this letter a hug from all 51 Million of us. You said it so well..Baie dankieBokke.. and Heineke thought he didnt make us proud.. in fact..Im more proud than in 2007..